We are engaged in the fast and efficient production of science lab apparatus that are used by students pursuing higher science education. 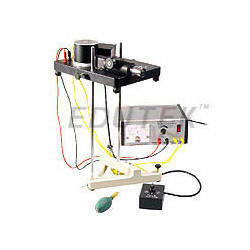 All the science laboratory apparatuses are a combination of sophisticated technology and streamlined production process. 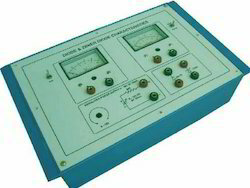 Experimental training board has been designed specifically to study the transistor input and output characteristics in different modes i. E. Common base, common emitter and common collector. This training board is an improved version with germanium npn & pnp transistors in addition to silicon npn & pnp transistors and four meters. The board is absolutely self contained and requires no other apparatus. practical experience on this board carries great educative value for science and engineering students. 01. Two 0-10v d. C. At 200ma, continuously variable power supplies for base emitter & collector emitter junctions. 02. Two d. C. Ammeters, 65mm rectangular dial with switch selectable ranges of 200 ma &10ma. 03. Two d. C. Voltmeters, 65mm rectangular dial with switch selectable ranges of 1v and 10v. 04. Two silicon (npn & pnp) transistors and two germanium (npn & pnp) transistors. 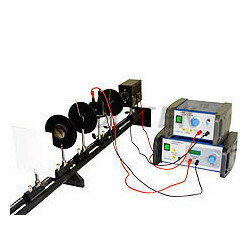 Experimental Training Board has been designed specifically for plotting the forward and reverse bias characteristics of a Germanium semiconductor Diode, and a Zener Diode. The board is absolutely self contained and requires no other apparatus. Practical experience on this board carries great educative value for Science and Engineering Students. To study and plot the forward & reverse bias characteristics of a Germanium semiconductor Diode. To study and plot the forward & reverse bias (breakdown) characteristics of a Zener Diode. 01. 0-10V D.C. at 10mA, continuously variable regulated Power Supply with low ripple & hum and integral current limiting resistor. 02. D.C. Voltmeter, 65mm rectangular dial, with switch selectable ranges of 1V and 10V. 03. D.C. Microammeter, 65mm rectangular dial, with switch selectable ranges of 50 mA and 10mA. 04. A Germanium semiconductor Diode mounted behind the panel. 05. A Zener Diode mounted behind the panel. 06. Adequate no. of other electronic components. 07. Mains ON/OFF switch, Fuse and Jewel light. Good Quality, reliable terminal/sockets are provided at appropriate places on panel for connections / observation of waveforms. 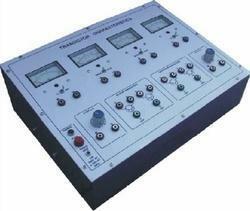 Experimental training board has been designed specifically for study of Series and Parallel Resonance in LCR Circuits, measurement of Q and dielectric constant of a liquid.Practical experience on these boards carries great educative value for Science and Engineering Students. Series resonance for different values of resistances, capacitances, inductances and plotting of resonance curves. Parallel resonance for different values of resistances,capacitances, inductances and plotting of resonance curves. 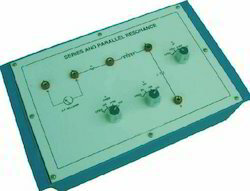 Measurement of Q for both series and parallel resonances. Measurement of dielectric constant relative permitivity of a liquid. The board consists of the following built-in parts :01. Three inductances made on ferrite cores, selectable by a switch.02. Three capacitances with low loss factor, selectable by a switch.03. Three resistances , selectable by a switch.Adequate no. of patch cords stackable from rear both ends 4/ 2mm spring loaded plug length ½ metre.Good Quality, reliable terminal/sockets are provided at appropriate places on panel for connections/ observation of waveforms.Strongly supported by detailed Operating Instructions, giving details of Object, Theory, Design procedures, Report Suggestions and Book. Weight : 3 Kg. (Approx.). Dimension : W 340 x H 110 x D 210. 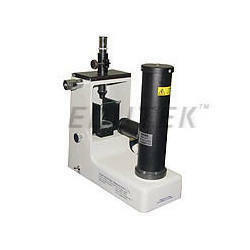 - Mounted on specially designed hexagonal optical bench. - Power Supply using safety sockets. - Kerr Cell and Monochromatic Light Filters imported from Leybold of Germany. 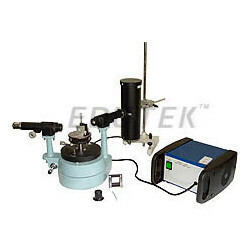 - Made up of Brass Spindle & other critical components on CNC for precision accuracy. 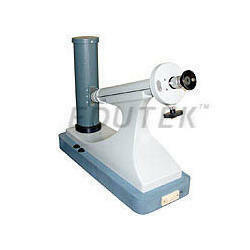 - Smooth & frictionless motion of telescope collimator & venire scale.